The famous Japanese aviatrix Izumi Fastenhi has disappeared on her solo attempt to fly around the world. Her last radio message, a Mayday call, gave her position as approaching the Island of Wai Ovadeah in the Morvalonesian Islands. This is a notorious hotbed of intrigue, home to bandits, pirates and other nefarious characters not to mention strange stories and legends. 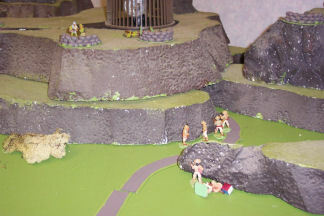 Four groups of International troops in the area are sent to rescue her. And the secret technology that went into the construction of her prototype aircraft. Lieutenant “Gimbals” Gillespie, a Scottish Officer of the “Highland Rifles” you are on loan service with the Governor of Wai Ovadeah Island in Morvalonesia to assist with a tricky problem. The local folks on the east side of the island were troubled by an invasion of giant spiders that were finally sorted out by Biggles and Gimlet. Now the west side of the island has a flying dragon attacking the villages. Each of the raids by the dragon is followed up by the Dragon Men who attack on foot leaving few survivors if there is any resistance. There is also intelligence that some sort of secret weapon is being developed in the area and that a famous female Japanese pilot is missing in the area. Lieutenant Yoshomi Dawai IJN Your ship, the cruiser IJNS Tabasko, is the closest to the island. You have been landed to search for her because her aircraft was fitted with some very secret direction finding equipment and she reported a secret weapon being used on her before contact was lost. Local intelligence is that she may have been abducted by the brigands in the hills. The so-called “Dragon Men”. Lieutenant “Fists” Tufsob The famous Japanese female pilot, Izumi Fastenhi, has gone missing on her round the world flight. Her last message was near the Morvalonesian Island of Wai Ovadeah. Your ship, the destroyer USS Sinklikabrick, was the closest to the island. You have been landed to search for her because her aircraft was fitted with some very secret direction finding equipment. Local intelligence is that she may have been abducted by the brigands in the hills. The so-called “Dragon Men”. You landed some distance away have borrowed a truck from a local plantation owner. There is also intelligence that some sort of secret weapon is being developed in the area. The Island was quiet apart from the gentle hum of the insects and the occasional birdsong. This was, however, not to last as the sound of motor lorry engines as they approached the mountains. Out to sea the sleek shape of an Imperial Japanese destroyer launched a landing craft that sped towards the shore. Little was to be seen. Careful reconnaissance might have revealed hidden dangers but the three units, having seen each other, raced forward boldly, some might say recklessly, towards the hills. The ground ahead was a morass and the vehicles soon were abandoned as they bogged into the mire. The Japanese did not even bother to unload their vehicle when they saw the state of the ground. N o sign of the missing plane could be made out even with the aid of high quality field glasses. 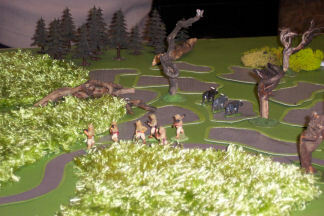 All three groups raced towards the hills and their objectives. 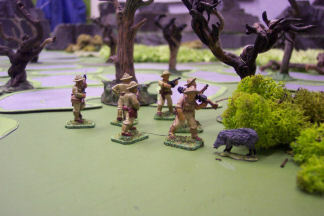 On their way across the swamplands the Marines (Semper Fi - Hoo Ah) are attacked by a wild boar which is promptly killed by the Lewis gunner. The figures are from Pulp Miniatures, the boar is from Irregular (I think) the ponds are card painted silvery blue and the dead trees are roots from fine Scottish heather plants. The other parties continued fairly uneventfully until the Japanese ran into some of Wai Li Gai's bandits and had a running fire fight with neither side scoring any hits on the other. Apart from these few bandits the wildlife and plant life posed most of the threats. The British chose a circuitous route that took them over mountains but by-passed the main enemies. The Japanese tackle a black panther. 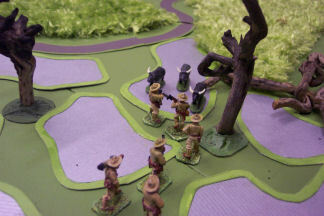 The Americans face up to water buffalo. 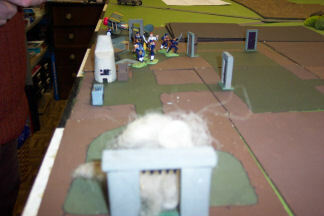 The Americans enter the long grass. The grass is a cut up door mat. 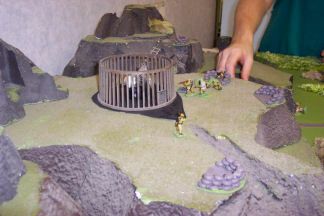 Arriving at the entrance to the cave complex the Lt Fists Tufsob "negotiates" with the defenders. 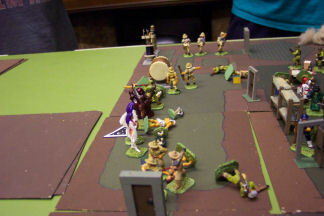 In the fire fight both sides lose casualties and the defending Chinese soldiers flee their sangars in a hail of bullets from Tommy gun and Lewis. The hills are expanded polystyrene, the sangars are made from beads from an old beaded door hanging thing. The "cage" surrounding the "secret diabolical weapon" came from some sort of filter thing that was found at work. The little counter beside the fallen figure is the way we keep track of wounds. Pink = Flesh -1, green = Wound -2, crimson = crippled -3, black = apparently dead. Simple but it works for us. 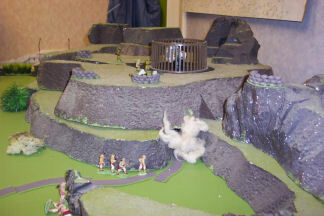 The hill top and the Secret Diabolical Weapon Fists "negotiates" with the gate guards and blows in the gate with a satchel charge. The other side of the blown in gate. The tunnel complex is made up of cards each about 6 inches square, each with rooms and corridors painted on one side and plain brown on the other. 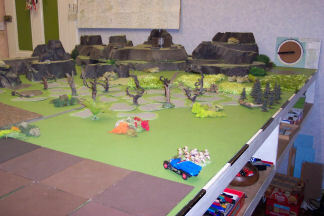 They are designed to interlock and when placed on the table a second layer (brown side up) is placed on top so that the players only see the card that they stand on or have passed through. 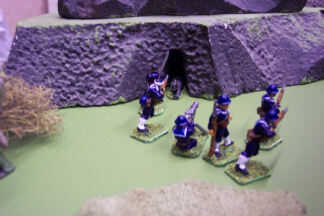 While the Americans created an unwitting diversion in the barracks the Japanese under Lt Yoshomi Dawai entered through a large cave. In the cave is a Nieuport 28 with a large yellow dragon painted on the fuselage. So this was the dreaded "Dragon"! The Aircraft is a Del Prado Die Cast in 1/64 scale picked up on e-bay. 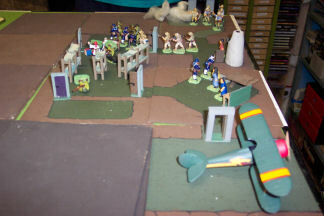 The range also includes a Sopwith Camel and a Fokker Dr-1 triplane all about 1/64 and very useful for 28mm figures. The combined forces of the Japanese, Americans and British are too much for the defending Chinese troops. 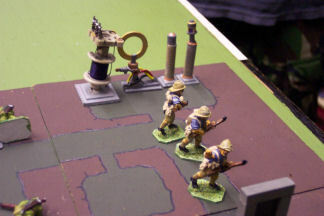 The figures are mainly Pulp Figures with a few Foundry and plastic figures picked up at wargame shows. The Japanese find and rescue the lost aviatrix as the British enter the power generators and destroy them thus disable the Secret Diabolical Weapon and also discovered several folders of secret papers. 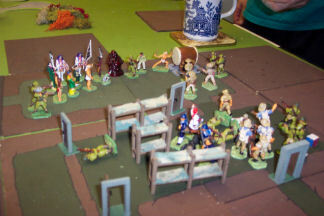 The Americans rescued several hostages that were being held against their will and all took captive the surviving minions and servants of the Mastermind. And so all parties managed some level of success. However, the Mastermind was not to be found! The British pass the control room of the Secret Diabolical Weapon. 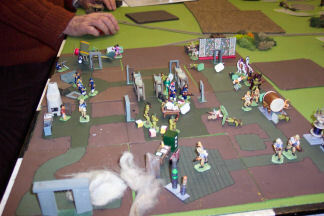 The Americans burst into the Mastermind's quarters. A view of the end of the game.